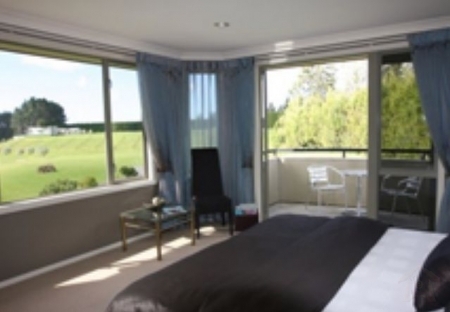 The Merlot Suite offers a private balcony with outdoor furniture where you can relax and enjoy spectacular elevated views of the harbour, tranquil ponds set in manicured gardens and grasslands, and vineyards. If you prefer, you can admire the stunning views from the comfort of your super-king bed with its designer throw, woollen underlay, quality cotton bed linen, and feather and down pillows. Unwind from your journey with a glass of wine, beer, or fresh juice from the complimentary mini bar in your room, or join us for pre-dinner drinks in our lounge with an open fire in winter, or outdoors on our large patio in the summer time. 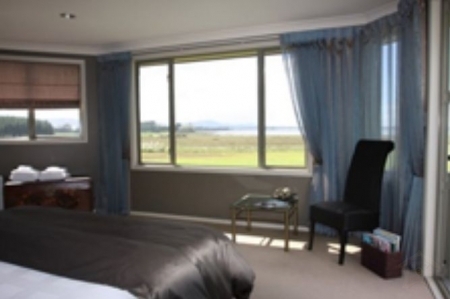 The Merlot Suite is architecturally designed with large windows to make the most of the panoramic views. Quality wooden furnishings and tasteful art add to the elegance of this room. Max 2 persons. Pamper yourself in the large ensuite, complete with spacious shower and heated towel rails. Luxurious towelling and robes add the final touch to this delightful bathroom. There are full tea and coffee making facilities in your room for your convenience. Dinner Booking necessary if required on night of arrival. 4 Courses for NZ$70 per person including wines. Max Number Of Adults is 2. Cancellation within 48 hours notice is 100% cancellation charge. Cancellation within 14 days notice is 25% cancellation charge. Please advise any dietary requirements/dislikes prior to arrival.